No one wants animals or insects to turn from cute outsiders to unwanted guests. But with industrialization, sometimes these animals have no where they can go and see your home as a place that they can safely live and feed. While you may feel for these animals, ideally you want to keep them away, because they carry disease, tear up your garden, and can be hostile to you and your family. 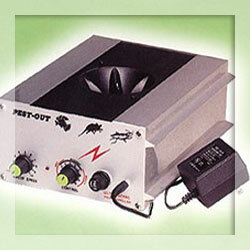 When someone wants to keep animals away from their home, garden or backyard, they often turn to ultrasonic repellents. How do Ultrasonic Repellents Work? There are noises that are too high a pitch for human ears, but can easily be heard by animals with which hearing faint noises can be the difference between life and death. These noises are referred to as “ultrasonic” and are traditionally thought of as any noise over 20 kHz. The decibel level of ultrasonic devices varies by manufacturer, but it is traditionally around 100 kHz. When an ultrasonic repellent is designed for a specific animal, the decibels are traditionally set at a level that is thought to be the most irritating to the animal. When the device is meant to repel all animals, the decibel level is likely to be slightly lower so that it can be heard by every creature’s ears. Much like high pitched noise can be irritating to humans, so too is ultrasonic noise irritating to animals. Most ultrasonic devices use motion detectors to scan for animal activity. Once they sense movement, they sound their imperceptible alarm and animals flee the noise. Many of the insect repellents work by sending the ultrasonic noise into walls and other areas that bugs like to live. The animal repellents, however, often are larger and placed outside your home in order to keep the animals away. There are similar animal ultrasonic repellents that are used indoors, such as those that you place in your attic to keep bats away. But all of them generally work in a similar manner, keeping animals at a predefined distance away from your home. What Types of Animals Do Ultrasonic Repellents Keep Away? The best part about ultrasonic repellents is that they do not harm the animals, so they can be safely used for any animal that you want to keep away from your property. These ultrasonic devices are the most common type of non-liquid animal repellent, and are one of the only long lasting ways to deter animals as many of the other methods available are unable to withstand time and weather.